In Indian cuisine, (for those who use garlic in cooking, for there are many who do not), this basic paste is a must have, make ahead, store in the refrigerator kind of treasure. There are many uses to it – a a flavor enhancer in a curry, to use to make a chutney/spread/dips/sauces, for various marination, and as a rub for vegetarian and non vegetarian dishes. It works wonders when you have this ready and do quick rub on meat, cheese or vegetables before a summer grill, or reach out for that little container and add some of it to the curry sauce you are making. I know that the shelves of the grocery stores are well stacked with innumerable varieties of the Chili Garlic pastes and sauces and I myself use the Sriracha sauce ever so often – more for that extra zing while cooking than as a condiment. But homemade pastes are always different and after all they are homemade where you have control over what you use and how much. The homemade chili garlic paste is used in recipes, will have a different flavor than freshly made garlic paste. The flavors and the intensity of the two ingredients blend and infuse while it sits, and the seemingly pungent flavors of the raw ingredients transforms into fragrant and aromatic when cooked with. How much you make, and also how much of it you use, is entirely up to you and you decide the proportion of the garlic to the chili or how spicy you want it to be. When I make the paste, I use the mortar and the pestle and do not use any water and the paste lasts for over a month in the refrigerator. 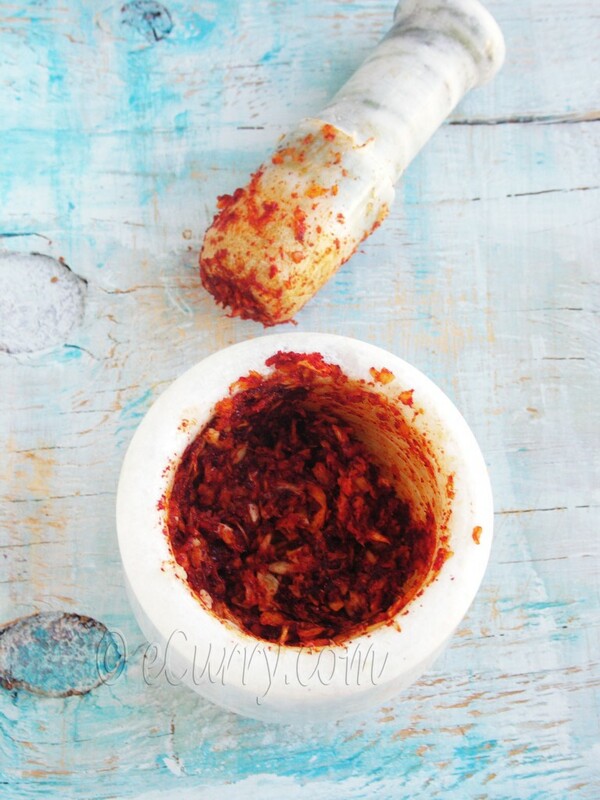 If you are using dry chili powder, it is easier to make the paste without water. The whole red dry chili pepper usually requires soaking. Do drain out as much water as possible after soaking and softening of the chili peppers. 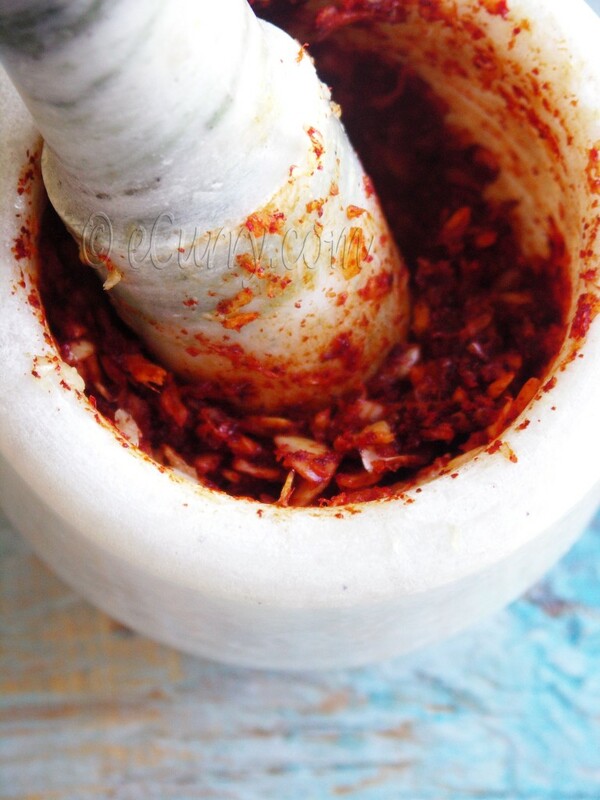 If you want the paste to be less spicy, use Kashmiri Red Chili Powder, which is easily available in Indian groceries. This particular kind of chili powder has beautiful color but less heat and imparts a wonderful red hue to the dish where it is used. Or simply use Paprika or smoked Paprika for a different flavor. If you are using red whole chili pepper, soak them in few tablespoons of hot water for about 20 minutes. If you want the paste to be less spicy, remove the seeds of the chili pepper. Once softened, remove the chili pepper from the water and drain on paper towel. Remove stems if any and if you have not already removed the seeds. If you are using store bought red chili powder, you are ready to start. 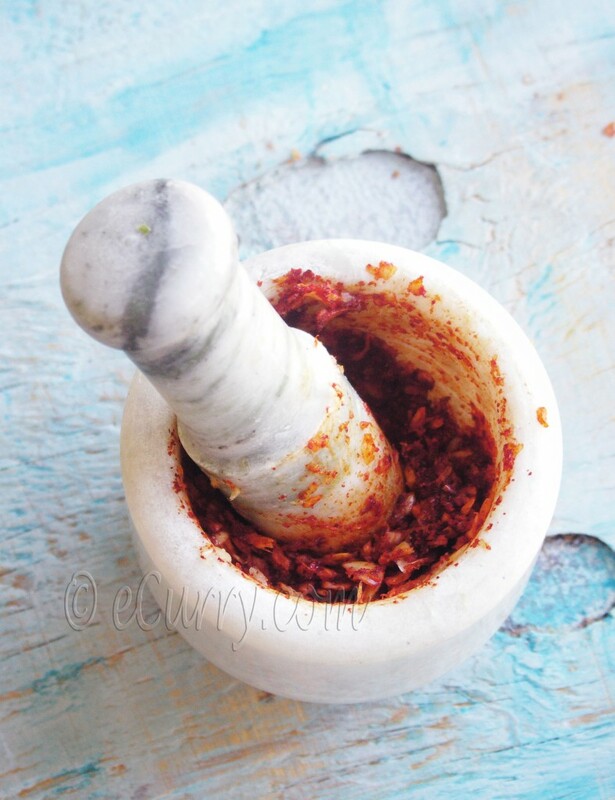 In a mortar & a pestle or in a food processor, combine peeled garlic cloves and chili peppers/or chili powder. Pound or process until you get a coarse mix. Do not use any water. Using no water ensures that this paste will store for a longer time. The consistency will be like a sticky coarse paste. Store in a dry covered container in the refrigerator for up to 3-4 weeks. Very colorful looking paste. Very inviting. Gorgeous pictures ..lovely and tasty mixture. Amazing colors! What’s better than chillies and garlic, ready to go! This is not a staple in our kitchens, but looks like that will soon change. ohhh I think this really tasty chili. Mmmhh, magnificent! Those are two of my favorite condiments. You know there are two aromas that totally knock my socks off in kitchen. One is red chili and garlic when pounded together and other is green chilies with ginger. Wow…..I am going to break my fast in half an hour and I wouldn’t mind some of that chili paste on the side. Gorgeous photos Somas. Just wondering why no salt or oil in it? I thought the addition of oil allows it to keep longer. This paste is looking so gud and infact a real essential ingredient in the kitchen. I fully agree nothing can beat the taste and aroma of fresh paste. I love all ur recipes and especially these kitchen essentials are bookmarked. So easy but still we take it for granted and keep buying. Now onwards a big full stop on store boughts and cheers to you. Thanks you !!! Two of my husband’s favorite ingredients. He will love this paste. Love your pictures, Soma. Onek din por…..lots to catch up here….wonderful photos as always !!! Very true, so basic yet so essential. A kitchen must have. I have been rediscovering my love for chili here in Singapore on vacation and also realizing the variety of flavors that can come with them. Love your paste and it looks essential for any chili-lover :). Oh what gorgeous pictures! And yes – such a basic ingredient that will find a use in any kitchen around the world! A must in my kitchen 🙂 Lovely click, Soma. I’ve looking for a better way to get a more savory recipe of this kind. Thanks for sharing. I am learning to make some wonderful dishes but I do have one question. Maybe I haven’t looked far enough through your site yet, but there is a garlic and green chilli paste/blend that is used in a bunch of the recipes I have. I am wondering which green chilli/peppers are best. So far I have used Anaheim as I’m still getting used to the spiciness of some of the dishes. The green chili garlic paste is usually made with the spicy peppers, usually the smaller ones like the Thai Bird kind. But to tell you the truth, anything will work. Serrano or even Anaheim if that is what works for you. It is the flavor which matters! So feel free to do it whatever you think suits your taste and tolerance.